Salmon and Mouse Bento, a photo by sherimiya ♥ on Flickr. 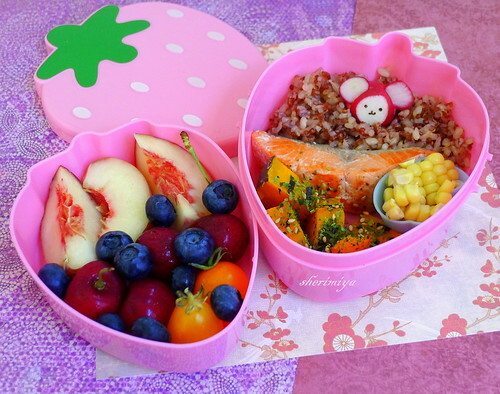 This week's salmon and rice format is packed in a newish two-tier strawberry shapes bento set from Daiso; so cute right? And only $1.50; you can't beat that. The only problem is that it's just a tad bit big, so I think the salmon layer probably moved around a bit by lunchtime. TinySprite gets red rice and salmon with furikake kabocha, a little cup of steamed corn off the cob, and a cute radish mouse. The lower tier contains white peach slices, cherries, blueberries and homegrown sunsugar and yellow pear tomatoes. Simple but satisfying. Squee at the radish mouse :o) And the strawberry box looks cute too. And even if the salmon moved around a bit, I'm sure she had a lovely lunch. Luckily she's not the type to get too bent out of shape at mixing of foods. She liked it well enough to finish it. Thanks Ingrid! I love the facial expression of this mouse. Hee hee so cute! When you put peaches/nectarines etc, does the fruit change color? Or you squeeze lemon? Your lunch is always fresh and delicious, and not to mention CUTE. You will be surprised how I make bento... it's like for an adult. LOL!! Actually I don't know if they change color; I haven't heard any complaint so I didn't worry about it. Lemon would work though. I bet your delicious bento get rave reviews, cute or not! My cute is very minimal! Oh, too cool! Where do you find individual containers from Daiso? There's a Daiso store near me; they have a big kitchen and bento section where I found this cute strawberry set. Not sure if it's available online. Love your bentos! I have a problem keeping the food from mixing. My kids never get to see what it's " supposed" to look like. Any tips?! Thanks! Helen, I have that problem too sometimes. This kind of deep container is not the best for making something delicate; I should have used something smaller and more snug. If you press the radish down into the rice, it has a better chance of staying put. Hope this helps!